Last season, the Mets produced a Cy Young Award recipient in Jacob deGrom. They also saw Zack Wheeler finally turning the corner and Noah Syndergaard emerging victorious in 13 of his 17 decisions. And that's not to mention Michael Conforto setting career highs in home runs and RBI, Jeff McNeil continuing to rake at sea level after tearing up the Pacific Coast League and Brandon Nimmo reaching base in over 40% of his plate appearances, all while making a good case to play Guy Smiley in a live action Sesame Street movie. What did all this individual success get them? Just a measly 77-85 record and a fourth place finish for the sixth time in the Citi Field era. But new general manager Brodie Van Wagenen insists that this year's Mets will be different than the previous two seasons. This year's squad has All-Stars galore in new additions Robinson Canó, Edwin Díaz and Wilson Ramos. Throw in Jeurys Familia, Jed Lowrie (when his boo boo heals) and the greatest first baseman in Mets history who still hasn't played a game at the major league level, Pete Alonso, and the Mets should easily tack on a few wins to last year's total, especially if none of their games against Derek Jeter's Marlins are postponed and not made up. Of course, I'm not an expert on anything. But I do know a good Mets prognosticator when I see one. That's why, back by popular demand, I give you our resident Studious Metsimus soothsayer. Please put your hands together for the one and only Magic Fortune Cookie. Why would you say that? I just paid you a compliment and if people want to applaud you for being good at what you do, you shouldn't tell them not to do so. Because you're a fortune cookie. Got it. Well, I think you're great. Except when you're insulting me. Which I'm sure you won't be doing this time around, right? I'll try to not ask silly questions then. Let's begin. How do you feel about Jacob deGrom finally being given the contract extension that every big leaguer and their mothers were getting this off-season? Wait, what? What kind of answer is that? That has nothing to do with my question. Well, you certainly did that. Now can you answer my question? And please leave the insults back at the restaurant. Thank you for your honest response. And why do you think it needed to be done? Were you afraid he'd take a dip in the free agent waters after the 2020 campaign without the extension? Moving on to his fellow moundsman, do you feel Noah Syndergaard or Zack Wheeler will ever put up a season similar to the one deGrom completed last year? And if so, which one has the potential to parlay such a season into a similar nine-figure deal with the team? And how can you be so certain it's Thor and not Wheeler who gets the big payday from the team? It most certainly isn't. Moving on to the bullpen, is the one-two punch of Jeurys Familia and Edwin Díaz going to mean lights out for the opposition if the Mets have the lead through seven innings? Hate to break it to you, but the 2010 team wasn't very good. Not only that, but they didn't really have an eighth inning guy. I mean, nearly half of Fernando Nieve's relief appearances that year came in the eighth inning and his ERA was an even 6.00. Well, that was an unfortunate and embarrassing incident in club history. Speaking of unfortunate and embarrassing, what do you think about the Wilpons' decision to finally have a Tom Seaver statue at Citi Field, announcing the news after his family revealed that he was retiring from the public life and would not be able to join his 1969 teammates for their 50th anniversary reunion at the ballpark? I can understand your feelings for Seaver, but why do you feel happy for the men who caught Seaver in 1969? Travis d'Arnaud probably won't be pleased to find out that you believe a couple of septuagenarians and an octogenarian are currently better equipped to handle the team's backup catcher's position. Fair point. Let's continue talking about up-the-middle players. 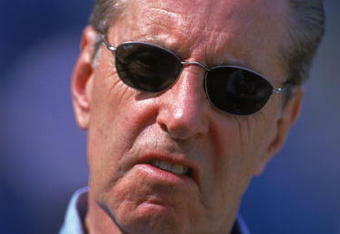 Why do you think Fred Wilpon agreed to take on the contract of Robinson Canó? He's usually allergic to spending money. Why did he change his ways for Canó? Oh, now I get it. Papa Smirk was a Brooklyn Dodgers fan growing up. Har-de-har-har. Let's move on to the outfield. Michael Conforto and Brandon Nimmo had strong seasons in 2018. But teams need three outfielders. Who will see the bulk of the playing time as the team's third outfielder? Uh, you do know that Céspedes will start the season on the injured list and may not play until very late in the season, if he plays at all, right? I suppose that could happen. At least you didn't say Dominic Smith, so I can breathe a sigh of relief there. And while I'm on the topic of first basemen, what numbers do you think Pete Alonso will produce at the position? That's not very impressive. Loney and González combined for just 15 HR and 60 RBI during their time with the Mets. Pretty much any first baseman can produce those numbers over a full season. That's promising news indeed! Next-to-last question. Do you think new hitting coach Chili Davis will help the team improve their putrid .234 team batting average, which was the Mets' lowest mark since the 1972 campaign? Wait, you're not a sportswriter. 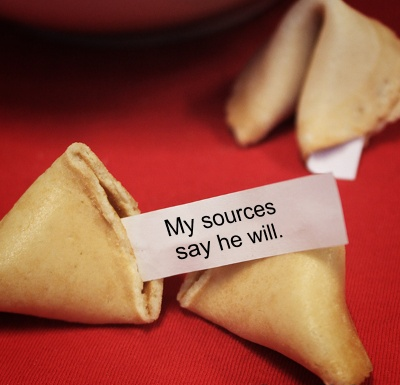 How does a fortune cookie have sources? Your predictions might be good, but your jokes - for a fortune cookie - are a little stale. Fine. Last question. What do you think the Mets' final record will be and where will they finish in the National League East? And here I was, thinking the Mets had improved their team enough to make it into October. On that note, I'd like to thank the Magic Fortune Cookie for doing the best it could at making difficult predictions about an unpredictable team. I'd also like to thank myself for exhibiting the self-control needed not to break open the fortune cookie every time it insulted me. There's only so much a non-sleep inducing blogger can take. Until next time, I hope you enjoy Opening Day, the 1969 reunion weekend and the rest of the season. And remember, if the Mets purchase the contract of Kirk Nieuwenhuis from the Long Island Ducks, we're all in trouble.